No, I didn’t sew an alien. In costumer slang, UFO stands for “unfinished object.” And like most historically inclined seamstresses, I’ve got plenty of those laying around. As of tonight though, there’s one less. That’s right, it’s a petticoat. I’m predictable. Deal with it. I actually sewed this petticoat a couple years ago. And it’s far from perfect. There’s the whole hem pretending to be a tuck issue. Plus the other two depressingly small and poorly placed tucks. It’s also a little on the short side. Last but not least, it was (until yesterday) missing a waistband. 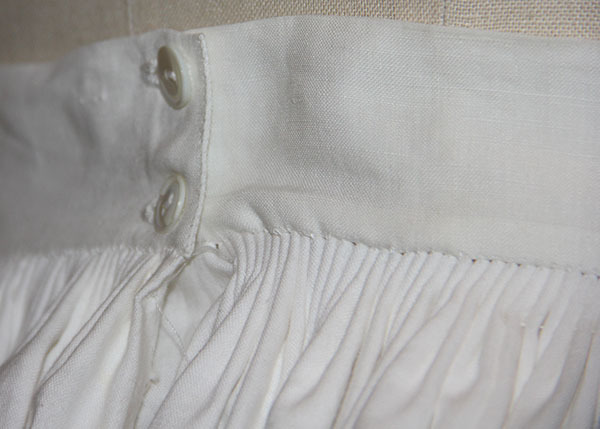 Just as I learned from the mixed up hem on this petticoat (my next petticoat had 6 generous tucks and a proper hem), I also took a few pointers from a previous petticoat waistband. Before, I used a strip of the same cotton as the petticoat itself. It worked okay, but felt a bit flimsy. I also had to reinforce the area where I sewed the buttons. This time, I decided to borrow a trick I’ve seen on a few extent mid-19th century petticoats and make my waistband out of closely woven linen. Truth be told, I simply cut off the wide hem of an old tablecloth, folded the cut edges in, and whipped it closed. Voila! 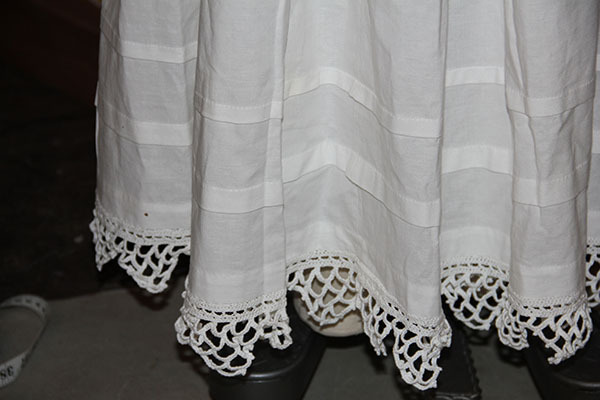 Perfect linen petticoat band. How historically accurate is it? Let’s say 90%. It’s entirely hand-sewn, with hand-crocheted lace from an 1855 pattern. The construction (minus the hem and tuck issues) is pretty much accurate. I used polyester thread. And the buttons are kinda wrong. They should be milk glass or thread probably. Hours to complete: Who knows at this point! The lace alone took weeks. The petticoat itself is fairly simple, so probably took under 10 hours. Setting the waistband added another 4 or 5. Total cost: About $15, counting the muslin and the cotton thread. The buttons were a gift from mom and dad way back in my teens (they gave me a huge bag full from a company that operates an antique button press — more accurate for late Victorian/Edwardian). I don’t recall where I got the cannibalized tablecloth.